Right at the beginning of the year, I posted about the top 4 ways I've already simplified my life over the years. I believe they've made the biggest impact in my surroundings and in my day to day routines. Since posting that, I've been reading up on what everyone is planning for in 2017, and a lot of people are embracing things like finding balance, slowing down, clearing out physical and mental clutter, devoting more time to what matters and less to what doesn't. Obviously, I love this. I have a whole section on this blog dedicated to the things I'm working on simplifying and I want everyone to embrace simplifying their lives in various ways this year. 1. Decreasing the amount of personal products I use. I mentioned that I'll be making my own hair care and skin care products, and once I start going down the list I plan on making just one of what works for me. No 12 kinds of shampoo lining my shower. No separate eye cream and face cream, just one oil that gets the job done. Making a conditioner that works well enough that I don't need detangler after the shower. Using the same wash for my face and body (raw honey, by the way.) My products are going to be very few ingredients and there's going to be less of them altogether. I know it seems like making them will be harder than buying them pre-made but the benefits outweigh the cons in my opinion. Post to come on my findings by the end of the year. 2. Decreasing the number of makeup products I use. I still have duplicates of things and those need to go, particularly the oldest products. 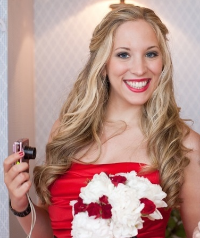 I also want to speed up my routine each morning and that comes from simplifying the number of products I use. I've been getting away from full face makeup every day and I generally don't think I need every single step I usually go through. And this is another area in which I'm going to try making some things myself (like primer, it's easy!) so I'm also simplifying my life in the fact that I won't set foot in a Sephora or Ulta all year. 3. Deleting more apps on my phone. I don't even know why I have a smartphone, to be perfectly honest with you. I don't use it any differently than I did when I had that Nokia brick back in high school, except I take photos sometimes and now I have an app that sets the alarm on our house, which is nice. I'm pretty good about keeping my phone uncluttered, but I'm going to go through and delete any apps that aren't essential, and then be really mindful about what gets added back on. 4. Letting Hootsuite do most of the social media work. Speaking of deleting apps on my phone, Twitter was the first to go. I decided that I'm done checking it and messing around with it this year, I just don't like it. I'm going to let Hootsuite go ahead and do all the work of tweeting out my posts, for anyone who does follow that way. It's already set up and I'm just sitting back and ignoring it. 5. Worrying less about what other people are going to do. I tend to get to wrapped up in the details of what other people are going to do when I plan things. Like, I make sure I know who's coming to my parties, so I can make sure they have food or drinks they enjoy, to the point of running out for things last minute because they didn't RSVP until 20 minutes before the event. If I make plans with someone, I make sure they know where they're going and check that they'll be there on time, to the point of answering 11 phone calls in a row because my friend is lost or can't park or needs to update me on traffic (Ida, that's mostly just you.) I'm not doing those things any more, it's too damn stressful. Everyone is an adult at this point, they can figure it out. I certainly make an effort when I have guests over, like getting the foods Tara likes, but Tara also lets me know weeks in advance that she's coming. So maybe it's not so much 'worrying less about what other people are going to do' as it is 'not catering to the last minute whims of disorganized people.' Your lack of planning is not my emergency. 6. Re-controlling my inbox. I do use unroll.me to make sure I get unsubscribed from things, but it does require updating from time to time, which I haven't done in awhile. I plan on getting all of those taken care of. I also have a couple of random yahoo mail accounts that I used when I signed up for promotions because I know they'll get tons of spam. I'm going to double check those and make sure nothing important is going there, and then close them so everything goes to my gmail accounts. I don't want anything to hit my inbox unless it's totally important and necessary, because I like to get to inbox zero at the end of every day. Having just one inbox to check and having that inbox be uncluttered is the ultimate in simplification. 7. Simplifying gift getting and giving. While I'm generally good about birthdays (I don't really do birthday gifts with many people), I let Christmas get away from me in 2016. I started planning and getting gifts way too late, which made it stressful and I probably spent more money than I would have if I had planned ahead. So this year, the planning is going to start early and end with asking everyone what they want, and then getting exactly that. Surprise element be damned. And if they tell me nothing, they're getting a donation made to an animal shelter in their name. I'm serious. Oh and when people ask me what I want? Amazon or Whole Foods gift cards. The end. I have an ongoing Amazon wish that I update constantly, because John likes to buy me 'things' instead of going the gift card route, so I just put 'stainless steel straws' and 'safety razor' on my list so we both win. (No really, those are things currently on my list.) And Bath and Body Works 3 wick candles, of course. People act like shopping for me as a minimalist is hard, but no - if I came away from Christmas with nothing but 37 new candles, it'd be my greatest day ever. Or donate to the animal shelter, that works both ways. 8. Planning less events and activities. That's not to say I won't still plan holidays that I enjoy hosting parties for, like (hopefully) Halloween and New Year's Eve. But I won't be planning something for every single holiday anymore, and I'm going to spend less time planning and coordinating other activities, like going to street fests, dinners, craft shows, blog events, etc. I'll still do these things, but more on a 'I'll show up, meet me if you want' basis rather than a 'meet me at this place at this time, we'll eat here, we'll go here next etc etc' basis. Hopefully relinquishing a little control will make me less frustrated when things don't go according to plan. And help me extend a little more grace to my few friends who are ALWAYS late. 9. Accepting less into my schedule in general. Not only am I not going to plan those things, I'm also not going to lock myself into attending them, even by accepting someone else planning them. I'm going to say no to more things, unless I really really want to do it. If it's just an 'eh, nothing else is going on, let's add it to the schedule' sort of thing, it's not happening. That way, I can decide last minute if I want to hit up a band's show, rather than being locked in and feeling guilty about bowing out because I'm too tired or want to just spend time with my dog. 10. Making (way) less complicated foods. I already make uncomplicated foods; I pull recipes from Pinterest mostly and if it's got more than 7 or so ingredients and more than 10 steps, I totally disregard it. But even then, those are the things I make for John. I don't care, personally, to eat anything more complicated than a burrito with rice, beans, and avocado. Generally I don't like my food to touch or mix, I'm still a child in that way. I also prefer simple flavors and I'm a major texture eater, meaning everything needs to have the same texture if it's going to be eaten together (like all those soft mushy things I listed in the burrito.) I have the palette of a 5 year old. Yet I always feel like I need to 'make' breakfast and lunch for myself. But I don't! The 'making' part is what throws me off my clean eating plan. I just want to buy things and eat them as they are, no cooking or mixing. Like cucumbers, or apples. Chop and eat, that's my kind of cooking. So I'm scaling back the effort I put into breakfast and lunch, and now that John will have dinner twice a week or more at the firehouse, I'll make those nights easy on myself too. 11. Buying longer phone chargers. Such a tiny thing, right? But it's going to help my stress level immensely. Until I tracked it and realized that the phone cord annoyance happened multiple times a day, every day, I didn't know how big of a bother it was. I'm just sucking it up and buying the extra long phone chargers. Weird, I know. But it deserves mention. 12. Using less cleaning products. Not that I'll be cleaning less, of course! But I currently have a bucket of different cleaning supplies for each little task, which seems ridiculous when you think about the fact that you can clean just about every surface of your home with vinegar, baking soda, or Castile soap, or some mix of those 3. I'm going to be making my own products, of course (to be more zero waste friendly and have less chemicals), and I'm also going to stop kidding myself that I need different cleaners for bathroom counters versus kitchen counters. 13. Extending the Do Not Disturb time frame. If you don't use the 'do not disturb' feature on your iPhone, you're missing out. Find it under settings. You pick the hours and while it's on during that time, your phone won't make noise. So no texts or calls! I do have mine set to still ring through if my parents or John call, because that means it's an emergency. But otherwise, no texts beeping and no drunk dials from friends (yep, I still have one law school bff who regularly drunk dials me on Saturdays to find out why I'm not out, but Jameson makes him forget the fact that he moved to Texas.) Currently the hours are set from 8:30 p.m. to 4:30 a.m. (the exact time frame I'm asleep), but I'm extending them. 7 p.m. to 6 a.m. If you call or text during that time, I will not respond until after 6 a.m. the next day, unless I happen to not be busy. I'm the boss of my time, and I don't want to be on the phone all night. It's usually about something stressful and I'd rather spend that time with John and Hawkeye. 14. Following the 'Use It Up' rule. It's exactly like it sounds - use something up completely before purchasing a replacement. Women tend to struggle with this when it comes to 1 and 2 on this list - makeup and personal care items. You probably have a stockpile going of a few things. I've gotten good at not buying more things but I've noticed that when I get excited about trying a new DIY for makeup or skincare, I tend to buy the supplies for that before finishing the actual product. Which is just wasteful and not conducive to my zero waste efforts. So I'm using up everything (unless it can be donated or given to a friend) before I buy any more chemical free supplies. As much as I want to try safer eye shadows, or make my own, I have to resign to the fact that I've probably got a solid year or even two left on my Too Faced palette! 15. Deleting more contacts out of my phone. And probably my e-mail account. I used to be pretty good about this. In fact, I just checked and I only have 53 contacts in my phone. However. I passed over at least 5 I know I don't need. Out they go! 16. Cleaning my purse regularly and putting it where it should be each night. This goal stems from the annoyance of not being able to find my keys lately. Oh they're in my purse, alright, that much I know. But it takes me forever to fish around and find them. My purse has gotten messy lately; I need to make an effort to keep it clean and put it in the designated spot in the front closet when I come in each night, so I'm not searching for it in the morning. 17. Making the bed every morning. I don't know if this will simplify my life, but experts seem to think it will. Or at least that it'll give me a sense of calm. You already know how bad I am at this. It's never been a priority or seemed important, but I'm adding it to the list to see if it makes a difference in my mood. And that's it, that's my 17. Are you going to try any of them? 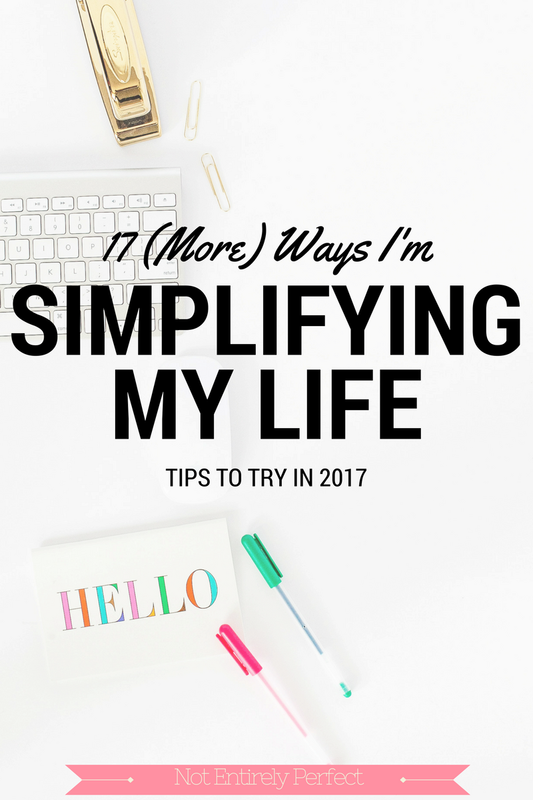 What else are you doing to simplify your life in 2017?